You need to add "C:\CCBoot\" in front of all the below commands. Opens the above dialog box. This command line is used for wake on LAN. after -wol type the clients name. It will refresh the disk. The last parameter is the Disk Name. This command line is used for restart client PC. Last parameter is clients name. This command line is used for turn off client PC. Last parameter is clients name. This command line is used for logs off client PC. Last parameter is clients name. This command line is used for Magic Shutdown client PC. Last parameter is clients name. This command line is used put the client to superclient mode. 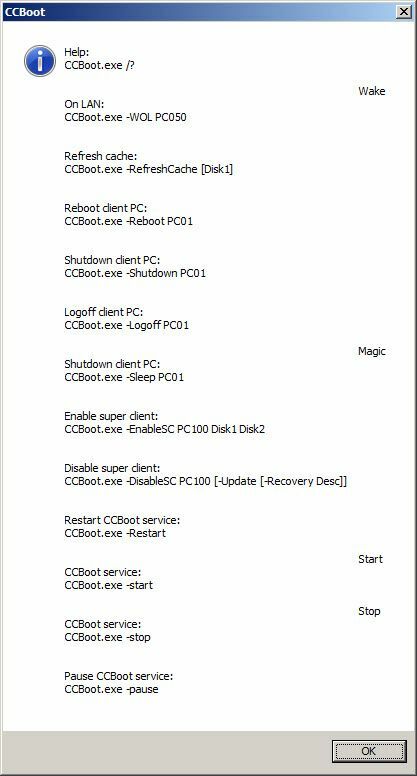 The middle part isclient name and disk1 and disk2 are image disks and/or game disks, -update will save the changes made using superclient to recovery point and -Recovery Desc will set the description for recovery point. This command will restart the CCBoot Services. This command will start the CCBoot services if they are stopped. This command will stop the CCBoot services if they are stopped.